A newspaper article published in The Oviedo Voice on January 2, 2003. The article features a number of students who are in Oviedo High School's Athletic Hall of Fame. Students include sisters Jenny Wise and Jill Wise, Brooke Asby; Alison Parker, Andy Gill; Steve Key, Jon Godwin, Steve Bratton, Hubert Priest, Ray Fore, and Walter Duda. Oviedo High School is a Seminole County Public School located in Oviedo, Florida. Originally called the Oviedo School, the institution was first established in 1932 as a K-12 school. In 1948, the secondary grades separated from the elementary school. The upper grade levels formed Oviedo High School and moved to the campus at 601 King Street. Oviedo High School is notable for The Lion's Tale, the award-winning school newspaper recognized by various national and state scholastic press associations of its high ratings from the Governor's A+ Plan for Education of and its successful athletics tickets. 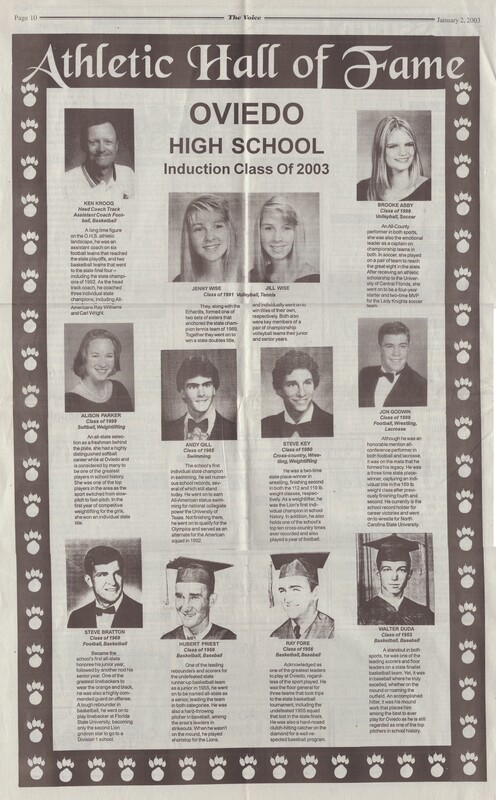 Original newspaper article: "Athletic Hall of Fame: Oviedo High School Induction Class of 2003." The Oviedo Voice, Vol. XIII, No. 1, January 2, 2003: Private Collection of Sarah Thorncroft. 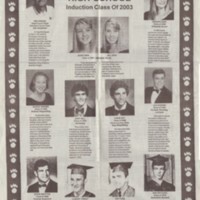 Digital reproduction of original newspaper article: "Athletic Hall of Fame: Oviedo High School Induction Class of 2003." The Oviedo Voice, Vol. XIII, No. 1, January 2, 2003. “Athletic Hall of Fame: Oviedo High School Induction Class of 2003.” RICHES of Central Florida accessed April 19, 2019, https://richesmi.cah.ucf.edu/omeka/items/show/6263.